The oldest part of the Alhambra is called the Alcazaba, or citadel, and only its massive outer walls, towers and ramparts are left. The most distinctive feature of the Alcazaba is its watch tower, the Torre de la Vela, and it was here that the flag of Ferdinand and Isabella was first raised to mark the Spanish re-conquest of Granada in 1942. 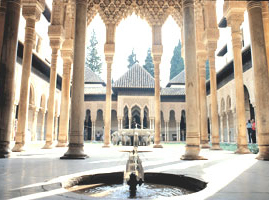 The Palaces of the Moorish monarchs (Los Palacios Nazaríes) are made up of a maze of beautiful courtyards linked by passageways and corridors, and filled with fountains, plants and ornamental ponds. One of these is the famous Patio of the Lions, with its central fountain supported by twelve lions in white marble, not designed with sculptural accuracy, but as emblems of strength and courage. The Generalife was the Moorish rulers' summer residence set to the east of the Alhambra and boasts magnificent gardens which, with their clipped hedges, grottos, fountains, and cypress avenues, are said to retain their original Moorish character. The Renaissance-style Palace of Carlos V was added later by the Christian monarchs, and some of the original Arab architecture within the complex was also altered and restored over the years, including work to repair damage caused by an earthquake in 1821. In order to protect the monument, there is a limit to the number of visitors per day. Therefore ticket numbers are limited and are sold according to availability. The tickets are always in great demand so an advance booking is recommended. If you decide just to turn up on the day get there as early as possible and be prepared not to get a ticket. The ticket is valid only for the day of the visit. Tickets are issued for entry in the morning, afternoon or evening and once you are inside you may stay until the end of the time limit on your ticket. During the daytime you can either buy a general day ticket, which gives you access to everything - the Palacios Nazaríes, the Alcazaba, the Generalife and gardens - or a gardens visit, which gives you access to the gardens, Generalife, Alcazaba but NOT to the Palacios Nazaríes. The evening visit ONLY includes the Palacios Nazaríes. If you already have a ticket then enter the grounds via the Justice Gate (La Puerta de la Justicia), otherwise go to the ticket office in the Access Pavilion (el Pabellón de Acceso). The Granada Card Tourist Pass also includes entrance to the Alhambra and the Palacios Nazaríes (as well as other main monuments, free bus travel and further discounts). Further information on the pass and how to buy it can be found on the Granada tourist board website. Your ticket will assign you a half-hour time slot for entrance to the Palacios Nazaríes, due to a maximum of 300 people being allowed in every half hour. If you miss your assigned time slot you will not be allowed in. 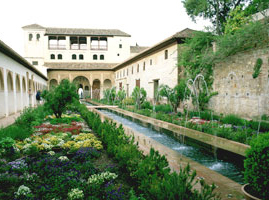 It therefore makes sense to enter the Alhambra well before your assigned time. You can then visit other sections of the Alhambra beforehand. The last entrance time for the Palaces will be one hour before closing time. (*) The daytime visits are in two sessions, morning tickets (08.30-14:00) and afternoon tickets (14:00 to closing).